The Skinny: This film has decent actors, but a cheap plot and annoying antics submarine everything. Watching this movie is like going to hell, only colder. by Kozo: Semi-sequel to Tricky Brains casts Lau Ching-Wan as the Tricky King, who is somewhat righteous despite being a master of practical jokes. He goes up against a Tricky King wanna-be (Law Kar-Ying), who isn't as righteous and demands the top spot. While their dueling consists of a variety of strange and nonsensical practical jokes, a sudden subplot emerges. 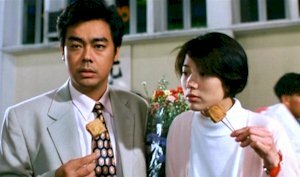 Lau accidentally blinds Anita Yuen, and the two engage in a C'est la Vie, Mon Cheri parody that's occasionally amusing (both starred in the original award-winning film). Then IT ALL GOES TO HELL. Or, more specifically, Eric Kot and Jan Lam appear and wreck everything.